“And now Chris Barnard…” Breyten Breytenbach wrote for today’s Die Burger. More recently, I remember a day when we sat together in the sun outside their house in Onrus, drinking what from that day on became my favourite South African bubbly: Krone Borealis. There were strawberries and laughter. The warmth of friendship. My thoughts are with Katinka and her loved ones. It was during the years leading up to my return to Paris in ’68 that censorship turned really bad. The situation was surprisingly complicated. Among the events that held me in South Africa, there was the emergence of a new generation of Afrikaans writers, the Sestigers (‘Sixtiers’); among those that prompted me to leave was the almost simultaneous crackdown of censorship. The complication lay in the fact that, in the South Africa of the Sixties, neither could be imagined without the other. Within only a few months of my return in August, 1961, I received a letter from the young author Chris Barnard (no relation, I should make very clear, of the surgeon who a few years later became famous for succeeding with the world’s first heart transplant). Chris was then fiction editor of the magazine Die Brandwag, for which I had during my student years, and even during my stay in Paris, written potboiler short stories. He offered me an opportunity of emptying my drawers of old manuscripts. But much more importantly, he broached the subject of ‘a new generation’ of writers in Afrikaans. This was something that had much preoccupied me in Paris. I had even written an impassioned essay for the magazine Huisgenoot pleading for such a new wave of writing: taking my cue from the Dutch writers known as the Tagtigers (‘Eightiers’) of the previous century, who had swept away all the dead wood of conventional writing in Holland to establish a spectrum of bold and passionate prose and poetry that infused the Romantic movement in the Low Countries with the inspiration of Impressionism and Symbolism. In our context, of course, it was no longer a matter of Romanticism, but all the ripple effects of Modernism and Existentialism. 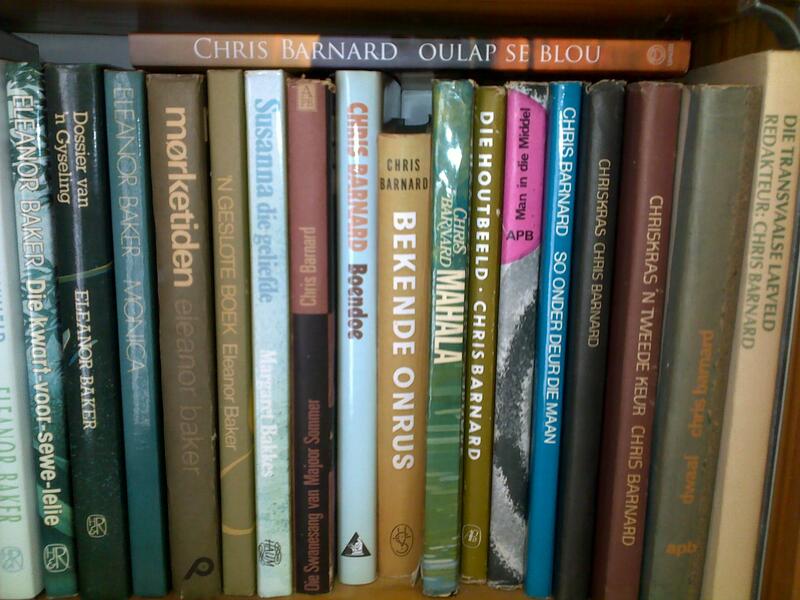 My essay wasn’t published until several years later, as a kind of nostalgic backward glance, but from the correspondence with Chris it was soon evident that we were fired by the same kind of vision for a drastic overhaul of Afrikaans fiction. Ever since the Thirties, when a group of young Afrikaans poets had boldly established radical new forms of individualism, our literature had been striving to break away from the more conventional expressions that had characterised it since the time of the First Language Movement in the late 19th century. Various spasms of renewal had followed, but these were invariably restricted to poetry. Fiction and drama still lagged depressingly behind; and by the time European literature was already experimenting with exciting new forms of writing, Afrikaans fiction was still largely stuck in 19th century Naturalism, echoing, at second or third hand, the surface features of the bleaker endeavours of the form, but without the passions of the great Russians, or the genius of a Hardy or a Hamsun, let alone an Undset, a Proust or a Musil. Our fiction, as the poet N. P. van Wyk Louw characterised it, was still locked in a local, cosy kind of realism dominated by locusts, drought and poor-whites. Now came the discovery that a new generation of Afrikaans prose writers was waiting in the wings: we had widely different backgrounds and styles and interests, but one passion we shared – to bring Afrikaans literature, particularly fiction and drama, up to date with the rest of the world. Most of us, by that time, had spent shorter or longer periods abroad, mainly in Paris, and that experience emphasised the parochial closeness of the local cultural scene. Chris had not yet taken his gap year, but was preparing for it – in spite of the misgivings of his then wife. I can remember her arguing: ‘I’m really not eager to go to Europe. I’m scared that it may change my view of the world, and I’m so happy with the one I have right now.’ What made the comment memorable was that it exactly captured the attitude of all too many Afrikaners at the time. Several authors had begun to move into prominence during the fifties. The early leading figure was Jan Rabie (born 1920) with his piercing brown eyes and defiant black goatee, strongly inspired by French writers like Henri Michaux and the Existentialists during his long stay in Paris, whose work was in no small measure one of the reasons why I ultimately decided to go to Paris myself – and one of the consolations about coming back in 1961, when he broke new ground with his passionate explorations of the Afrikaners’ early interaction with Africa. There was also Etienne Leroux (born 1922), a Mephistophelian figure always obscured behind dark glasses, soon to become the leading novelist of the generation, whose outrageous satires in the vein of the myth-mongering of his time provoked the religious and political establishment with his irreverence and wit. But he presented this establishment with a peculiar challenge: as the son of a respected cabinet minister in the Nationalist Government, he was not an easy target for ostracism or attack. Bartho Smit (born 1924), a dramatist, deceptively gentle in manner and appeareance. As a publisher, uncomfortably ensconced in the right-wing house of Afrikaanse Pers-Boekhandel, later Perskor, he became something of a mentor to most of the rest of us and was the moving spirit behind the quarterly journal Sestiger which, for the two years of its existence, became the mouthpiece of the whole group. After early work in a conventional, if charming, vein, Dolf van Niekerk (born 1923), a self-effacing loner, made an electrifying impression with his existentialist reimagining of early 20th century Afrikaner history. The other Sestigers were younger. Adam Small (born 1936) was the only coloured writer in the group, an affirmative presence with his angry and satirical poetry, his virulent rejection of apartheid, and his brilliant play, Kanna hy kô hystoe (Kanna Comes Home), which brought Afrikaans drama up to date with what had been happening in the rest of the world: an evocation of the lives of a coloured family who are forced to bear the brunt of the only one among them who manages to break away and lead a prosperous life in Canada, until the death of the materfamilias, Makiet, forces Kanna to return home. Abraham (Braam) de Vries, born in 1937, whose eyes, forever gleaming behind thick glasses, missed nothing, soon became adept at exposing the terror and magic that lurk below the surface of the everyday. And of course Chris Barnard (born 1939), a gentle giant, revealed an early interest in the taboos of apartheid before making a decisive break with realism in favour of symbolism, and an exploration of the absurd. On the fringes of the Sestiger group the most important new writer was Breyten Breytenbach, who had settled in Paris in 1960, while I was still there, although we did not meet until 1964, when Ingrid and I were on our disastrous way to Spain. Breyten hit the world of Afrikaans letters like a force of nature, splashing a Black-Southeaster rain of surrealism, existentialism and Zen Buddhism across the still rather arid South African landscape. For many years, and in the minds of many people, the appellation of Sestiger applied pre-eminently to Breyten. Yet he persistently refused to be regarded as a member of the ‘movement’, both before and after his imprisonment from 1976 to 1983 on largely trumped-up charges of ‘terrorism’. Others on the periphery of the core group of Sestigers included the master of Chekhovian impressionism, the short-story writer Hennie Aucamp; Elsa Joubert with her explorations of Africa and her persistent redefinitions of the Afrikaner world and heritage; and Karel Schoeman, who rather preciously cultivated the image of the enigmatic outsider, whose delicate prose explores the human condition within a South African context. In his best work he is a consummate novelist, but he resolutely steered a course separate from that of the Sestigers. And then there was Ingrid. Who was a Sestiger in all but name, and who produced the major poetic work of the time in Afrikaans. Her prose alone, a handful of exquisitely wrought stories and sketches, should qualify her for inclusion in the group. So did her dramatic break with the ancien régime represented by her father, her uncompromising rejection of apartheid, and her embracing, under the influence of Uys Krige, of the free-verse forms of Lorca and his South American successors. Dit was in die vroeë jare van die Sestigs, toe ek nog in Parys aan die studeer was, toe ek vir die eerste keer ’n brief van Chris Barnard uit Parys ontvang het. Daarmee het ’n korrespondensie aan die gang gekom wat tot vandag toe nog nie heeltemal sy einde bereik het nie, ofskoon die klimmende jare ons al op verskillende maniere probeer bykom of stilmaak het. Op ’n tyd het Chris beplan om met sy destydse vrou, Annette, vir die eerste keer op Grahamstad by my en Estelle, my eie eerste paaltjiewagter, te kom kuier. ’n Nogal rampspoedige eerste kennismaking, want soos dit teen donkeraand geblyk het toe die Barnards hul bagasie uit die motor wou gaan haal waar ek die tasse al met die intrapslag uit die motor in die straat vlak voor die voordeur wou gaan aflaai en ons gesamentlik agtergekom het dat daar g’n teken meer was van ’n tas klein of groot nie. Waarskynlik het ons toe al pens en pootjies ingesleep geraak by die gesprek waarmee ons toe reeds begin het en waarby daar tot heden vandag toe nog nie tekens van ’n verslapping sigbaar is nie. In die loop van daardie aand het Annette al wat flikker is, uitgehaal om dit aan die twee jong konstabels by die gestrande motor te vertoon, toegelig met histrioniese vermoëns wat vir my heelwat meer beïndruk het as vir Estelle: sy het verseg om in die swyende tweestryd tusen die twee vroue kans gesien om selfs maar ’n aks bes te gee. En Chris het ’n oorpyn ontwikkel wat vir niks wou skrik nie. Maar dit alles het minder as niks geweeg vergeleke met ’n lotsbestemming nie. In die tussenjare was daar in die vriendskap al korter of langer hiate, om beter of swakker redes, van die soort wat jy maar in byna elke menslike verhouding teenkom; maar nooit – selfs nie in die maande wanneer dit tydelik tot stilstand gestotter het as een van die twee, of soms albei, deur ‘omstandighede buite ons beheer’ – voorlopig onkapabel was nie, was daar werklik enigiets gewigtigs in die weer nie. Chris was vir ’n ruk weg Parys toe, en daarna weer ek, en daarna is hy weer getroud, en toe weer ek, en toe weer ek, en toe weer ek, ensovoorts. Maar iets het tussen die twee van ons bly aanloop asof daar nooit enige onderbreking was nie. Op ’n onderwaterse vlak het ek en hy daardie gesprek tot vandag toe bly deurvoer. Nou is hy en Katinka saam, en ek en Karina, hy in Mpumalanga en ek in die Kaap. En mits die vlees geneë voel en die vermoë behou, behoort dit tot in lengte van dae so voort te gaan. Onder destyds se Sestigers is daar vandag nie danig veel meer oor nie, so ons sal maar aanhou tot waar die karrentjie sy staanplek kry. Daar is min wat hierdie afgelope jare – nou waaragtig al meer as vyftig! – nie neerslag gekry het in ons korrespondensie nie. Soveel veugdes, soveel hartsere. Soveel huwelike, soveel egskeidings. Toe ek Ingrid destyds ontmoet het, was Chris een van die eerste vriende wat in ’n brief daarvan gehoor het; en ook hy wat heel eerste was om van die patetiese digpogings te siene gekry het wat ek vir Ingrid geskryf het. Oor die jare was ek jare lank een van sy eerste lesers, en omgekeerd (en vandag bly hy een van die bestes). Dit was – en is – wat ons probeer eerlik hou het teenoor mekaar. En dit is nie te versmaai nie. Tussen hom en Bartho is die eerste gedagtes oor die moontlikhede vir vormgewing van Orgie gewissel. Met verloop van tyd het ek en hy elkeen, as ek nou reg tel, vier kinders verwek, en hande vol romans, verhale, draaiboeke en ander pennevrugte die lig laat sien. Oor en weer het ons gehelp om probleme uit te stryk, kritici uit te sorteer, idees te toets, mekaar op die skouers te klop, skoppe onder die gat te gee, of so na aan trane afvee te kom as wat ’n mens jou gevoeglik durf veroorloof het. Nie een van ons het verwag om so oud te word dat ons dertig van die agterkant af sou kon bekruip nie. En destyds was Sestig nog net ’n literêre begrip, g’n werklikheid of ’n simbool of ’n ding nie. Vandag is die wêreld ’n anderster plek. Maar op die een of ander manier probeer ons byhou. En ons kan nog altwee, deur die genade of een of ander moedswilligheid ons variasie probeer opsê van: Ek was toe Bart Nel, en ek is wragtag nog hy. En halleluja! This entry was posted in Memories and tagged Afrikaans writer, André Brink, Chris Barnard, Katinka Heyns, Sestiger, writer on December 29, 2015 by Karina. 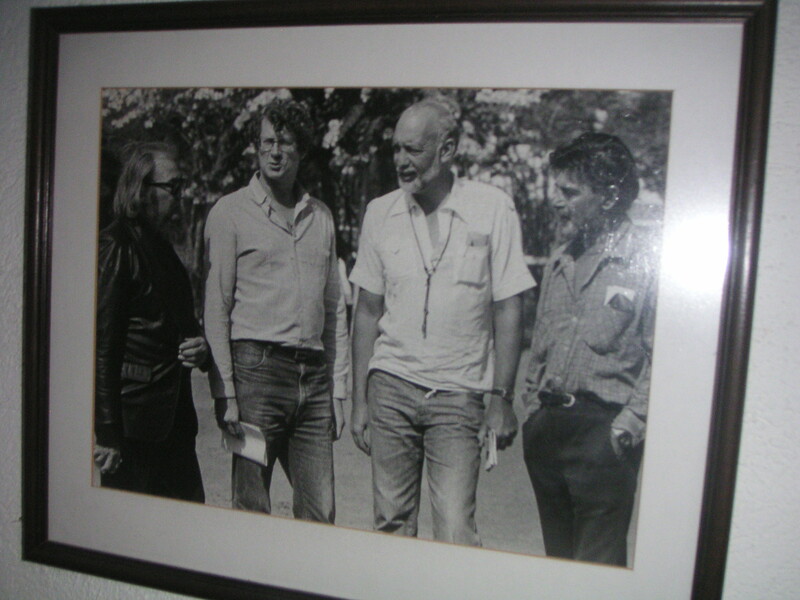 What about the other two in the photograph …? Afrikaans writers Etienne le Roux and Jan Rabie.